Below are a few of the groovy members of the Little Red Church Community. If YOU'RE a groovy member of the Little Red Church Community and want to add your profile to the website, please click the link on the right. Fung Loy Kok Taoist Tai Chi teaches a form of tai chi that is made up of 108 movements that promotes wholistic health for it's practitioners. 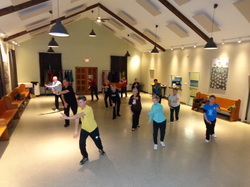 Our goal is that you feel balanced and comfortable and that you have fun in our classes. Click here. I'm Part of the LRC Community! ​We're so glad you're part of the Little Red Church Community and want to feature you on our website. For more information, click here!